During this time of year, I usually don’t do that many Thanksgiving Day projects, simply because I am too excited about Christmas. 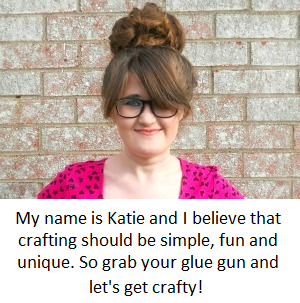 However, all holidays must be crafted for equally, so today I will be showing you how to make your own unique place card holders! Today's project is part of my collaboration with Xyron since I'm a member of their design team! 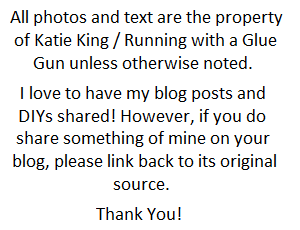 This means you will be seeing some Xyron products in action! 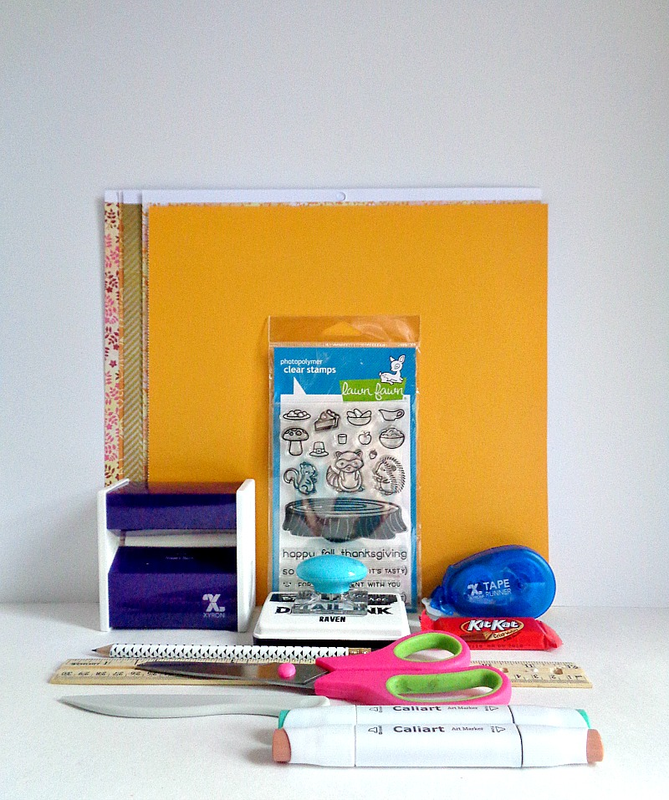 For this particular project, I will be showcasing the Xyron® 3'' Disposable Sticker Maker and Xyron® Tape Runner. I've talked about the Xyron 3’’ Disposable Sticker Maker and Xyron Tape Runner before, so if you want to learn more about them, then click here (for the Xyron 3'' Disposable Sticker Maker) and click here (for the Xyron Tape Runner). Before I begin, I do want to say that this project is similar to my DIY Mini Candy Gift Boxes. However, the main differences are that these place card holders do not have to hold just candy. In my final photos below, I will show you how to fill your place card holders in three different ways and I will talk a little bit more about what can actually go into these holders. 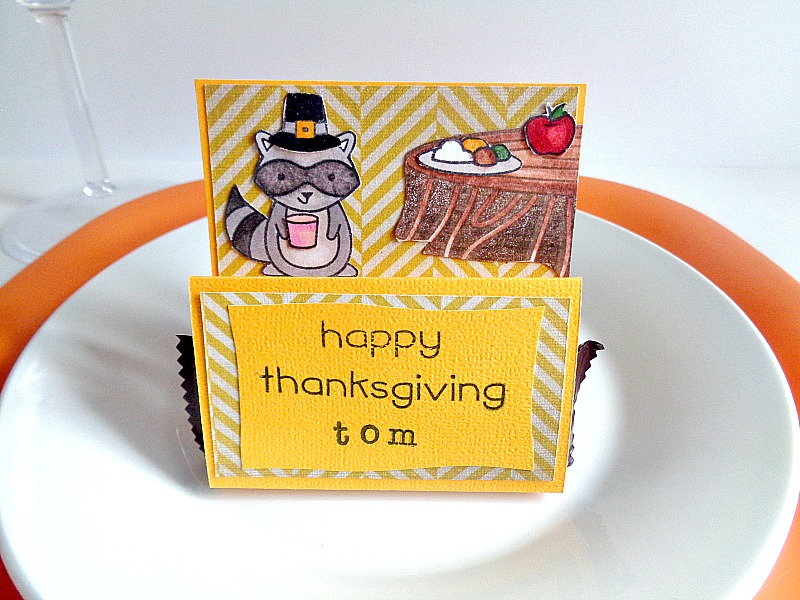 So, if you want to learn how to make your own Thanksgiving Day Place Card Holders, keep reading below! 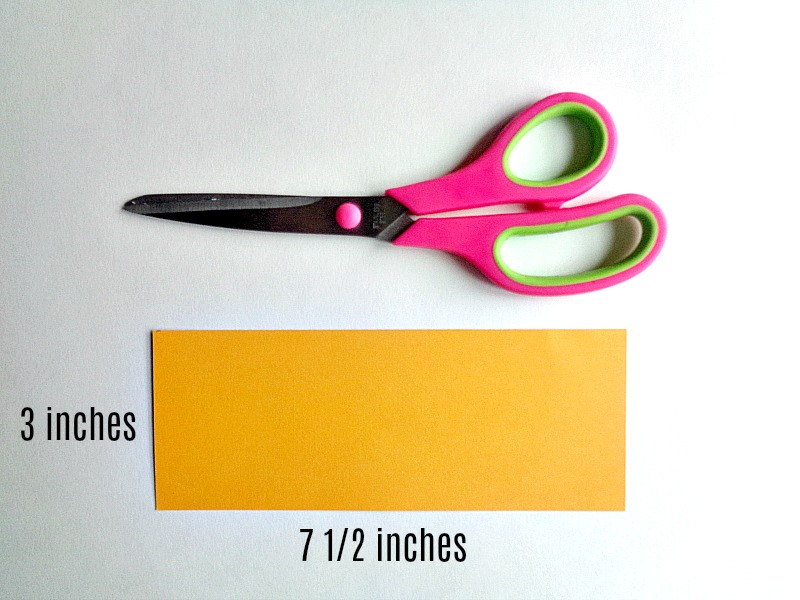 Step 1: Cut out a piece of scrapbooking paper that is 7 ½ inches by 3 inches. 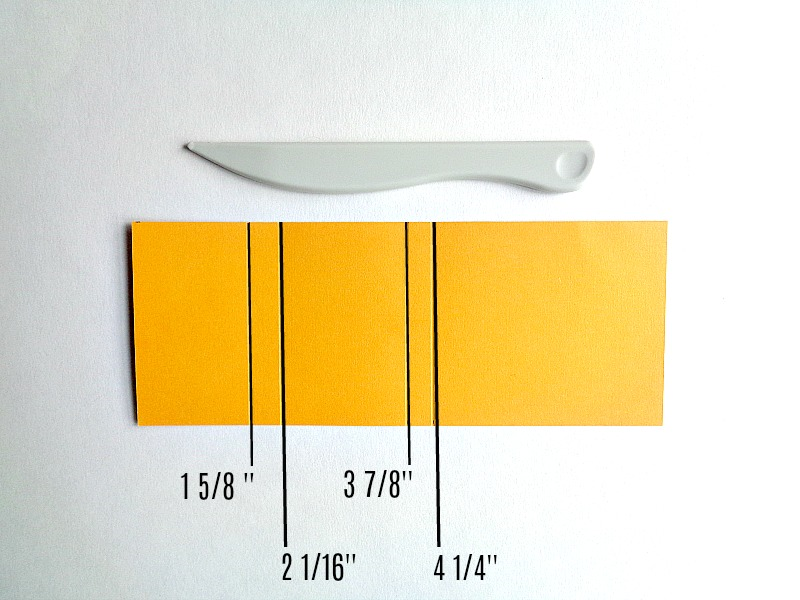 Step 2: Flip your scrapbooking paper piece over and score lines at 1 5/8 inches, 2 1/16 inches, 3 7/8 inches and 4 1/4 inches. Step 3: When you are done scoring your lines, you will notice that you will have a long side and short side on your paper. 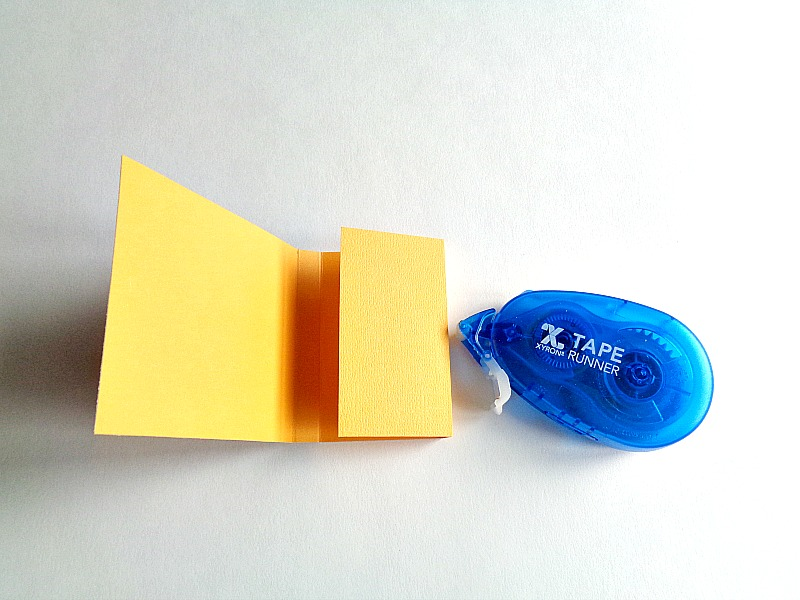 Fold over the short side of the paper (like in the above photo) and apply some Xyron adhesive (using your Tape Runner) to the folded edge. Then fold that part onto the long side and press it down using your scoring tool. 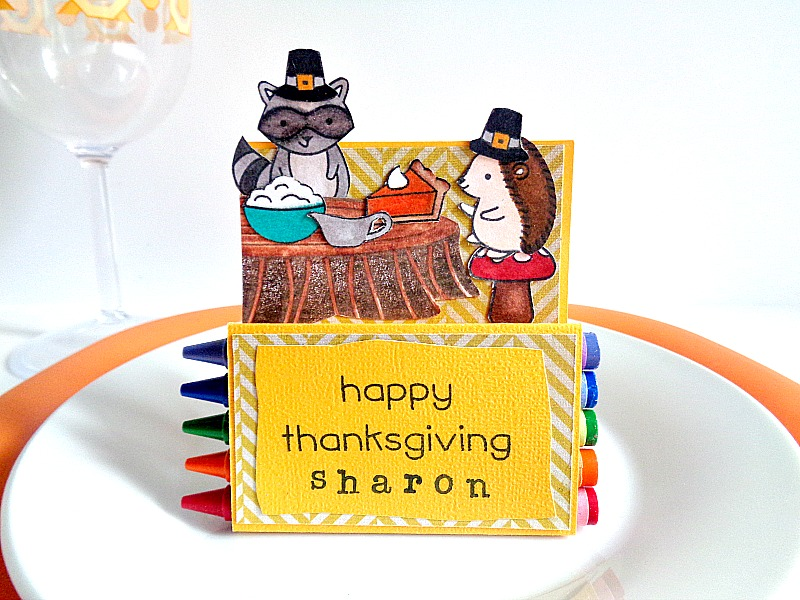 Step 4: Now it’s time to think about how you want to decorate your Thanksgiving Day Place Card Holders. For my place card holders, I cut out 2 pieces of decorative paper which were 2 11/16 inches by 1 5/8 inches. However, I didn’t stamp onto these pieces of paper, so I put them to the side. For my main decorating, I used Lawn Fawn's Forest Feast stamp set. To do this, I simply peeled off the stamps and adhere them to my acrylic block. 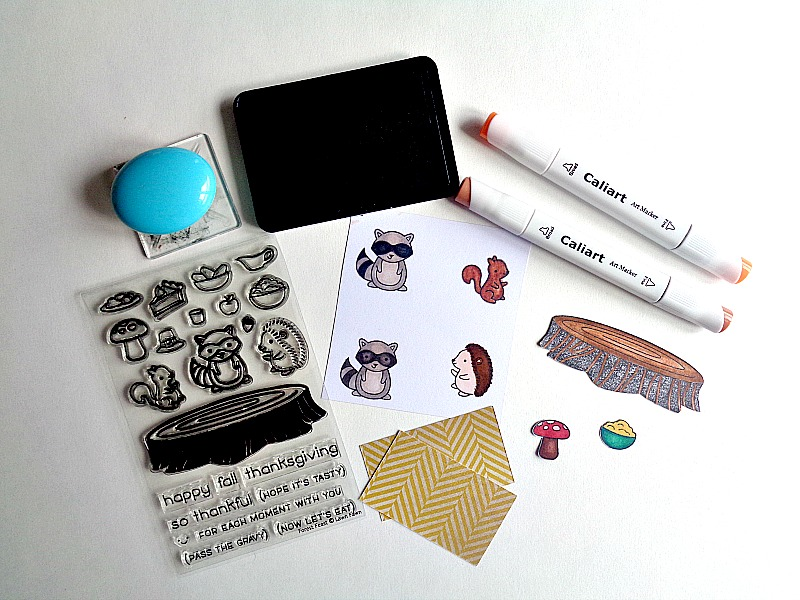 Then I stamped them onto some white cardstock and colored each one in using my Caliart markers. Once I was done coloring, I cut out each image using my scissors (since I didn’t have the matching die-cuts). 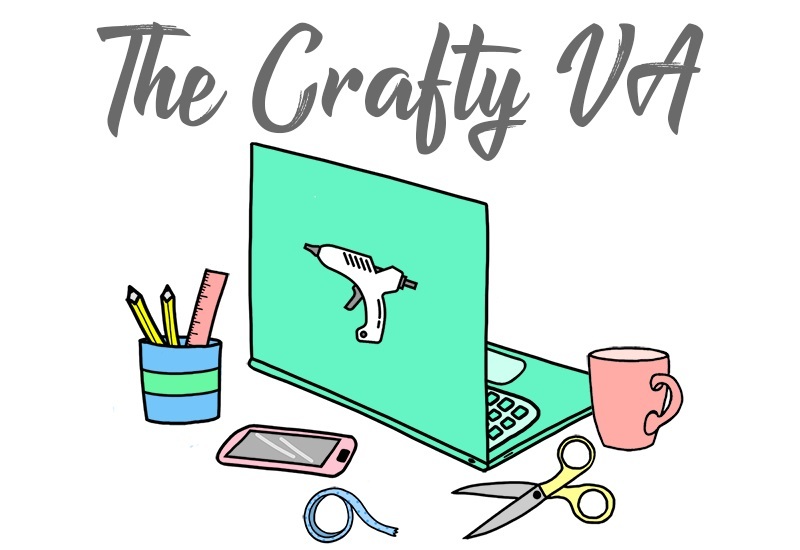 One thing that you will want to think about during this step, is whether or not you want to hand stamp or hand-write a person’s name onto a place card holder. Personally, I don’t like my handwriting, so I chose one of the phrases from the Lawn Fawn's Forest Feast stamp set and stamp out the person’s name. I forgot to show that in this step, but you can see the finish look in the photos below. 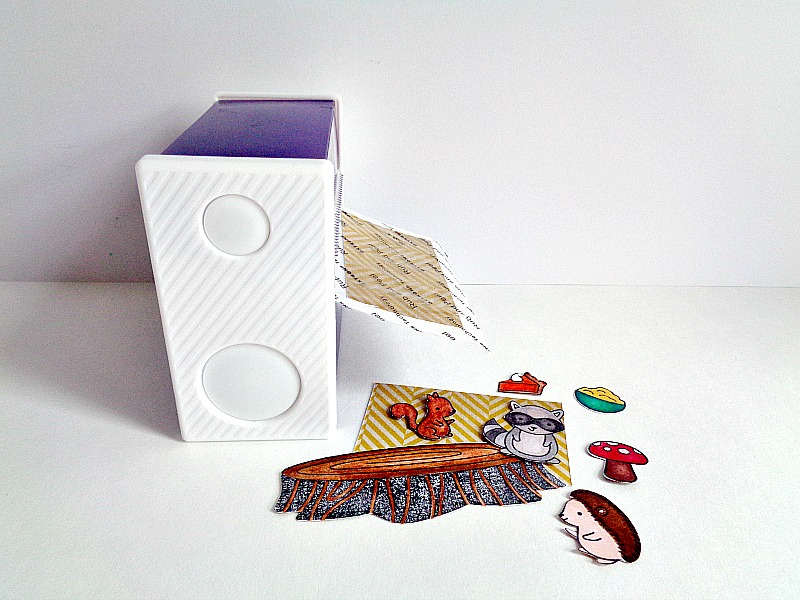 Step 5: Once all your stamp pieces have been colored, begin sliding them through your Xyron 3'' Disposable Sticker Maker. Keep repeating this process until you have run each piece through your Xyron Sticker Maker. Crafty Side Note: I realized, as I was making this project, that I had brown ink for the tree stump. So above, you will see tree tree stump in black, but I ended up restamping the image in brown. Step 6: Now gather up of your paper pieces and rub the top of the Xyron sticker paper. Then peel each paper piece off the sticker paper and adhere them to the front of your place card holder. For my place card holder, I first added the decorative paper. Then to decorate the top of that paper, I added my stamped images. Finally, I added the main piece of paper that displayed an individual's name, onto my place card holder. Once your place card holders have been decorated, you are ready to fill them up and display them! 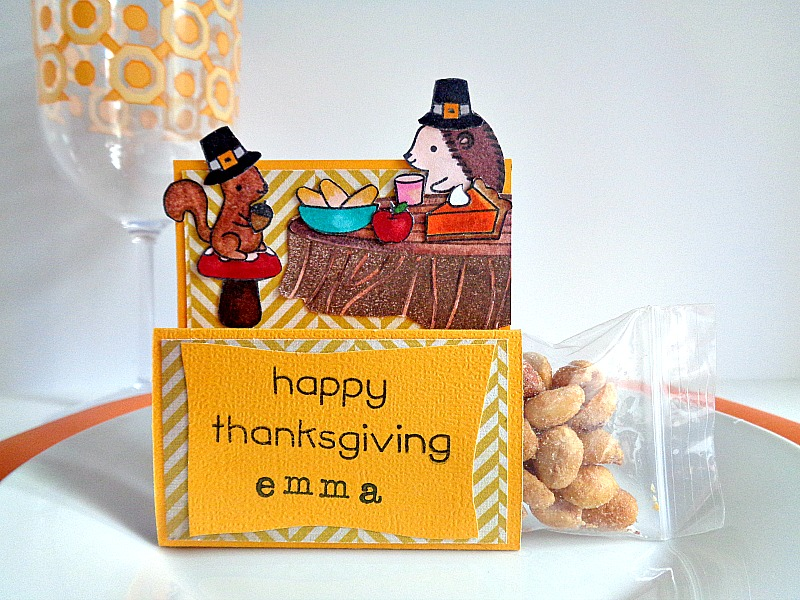 What is really nice about these Thanksgiving Day Place Card Holders, is that they serve a purpose but allow you to share something small with your guests. Overall, I loved how each one turned out! As I mentioned before, these place card holders do not have to hold just candy. For example, these place card holders can hold crayons for little kids (like in the Sharon example) or you can fill up small bags (like in the Emma example) and place them inside the holder. Now, if you want to go the candy route, I would recommend using ''flat candy''. For example, a mini Heresy bar (like in the Tom example), a mini Kit-Kat bar, or 3 Hersey’s Miniatures bars. Personally, I tried to put a mini Almond Joy into these holders and it did not fit well. So, again, I would use ''flat candy'' instead of ''chunky candy''. What do you think? 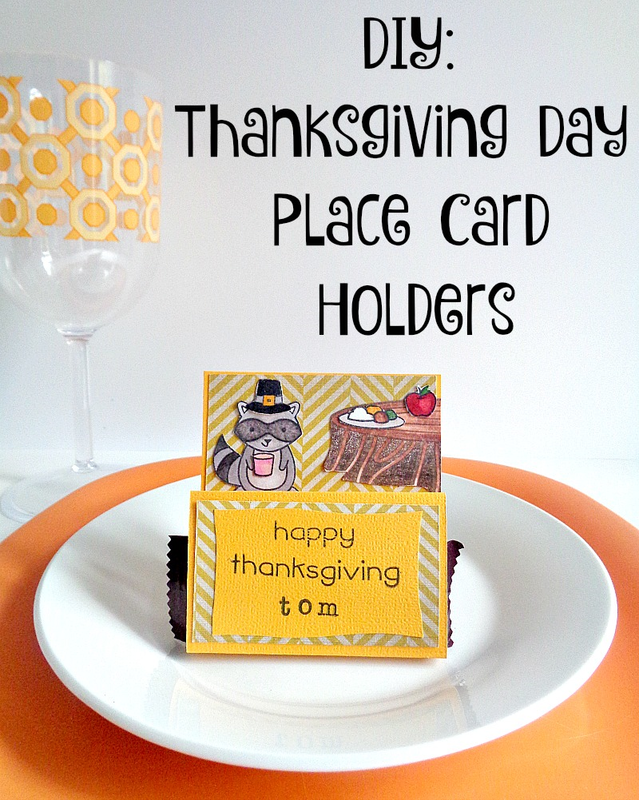 Do you like these Thanksgiving Day Place Card Holders?